This really works – that subtle contrast is just right for this view and adds interest without being overpowering. Man, I LOVE that fabric. I’ve been trying to find good sweatshirt fabric everywhere and it’s impossible. I love what you did with the pattern too. Ummm it is the BEST fabric! Seriously, I’m practically sitting on my hands to prevent myself from ordering more haha. I hope this ends up being one of the fabrics that Mood just regularly carries and restocks. This is just gorgeous (am I saying that about a sweatshirt? oh, yeah!). And what a very perfect color on you. Thanks for your tips about sleeves, and I love how you reversed the fabric for the yoke. However, I don’t have a serger, just a basic sewing machine. 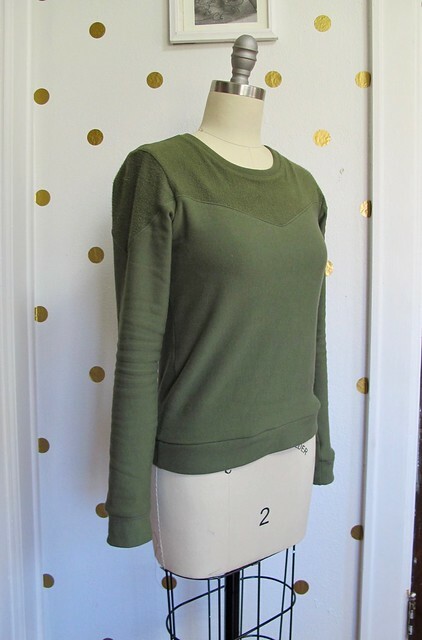 Could I make this sweatshirt, basically as is (pattern, fabric, etc. ), without getting more tech-y? Thank you! 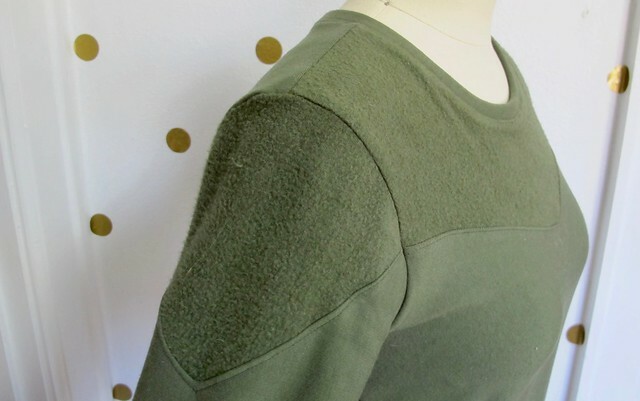 You definitely don’t need a serger to sew this. I just used mine because I happen to have it haha. It would be fine with a regular sewing machine, though. Ooh that looks so cozy! I’m please and surprised that there still exists sweatshirt fleece that isn’t half-polyester–that stuff is too sweaty. Yeah, this stuff is pretty amazing! Not sweaty at all! Really like your sweatshirt. 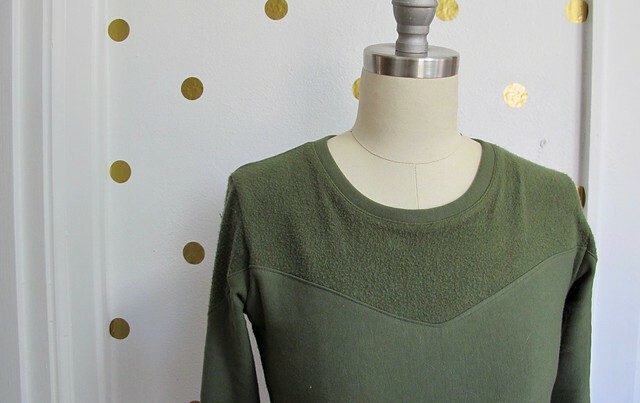 I’m currently reading Palmer/Pletsch’s book on knits and it mentions that a lot of the knit fabrics used by RTW manufacturers have more stretch in the lengthwise grain; it is more economical. Lately, these fabrics have started showing up in fabric stores. Something we need to be aware of so that we buy the correct amount of yardage for our projects. I never thought of that, but it makes perfect sense. Fortunately, I bought more than I needed (I still have about a yard leftover) so it wasn’t an issue, but something to keep in mind for future project yardages. I like your take on this Lauren. I didn’t really fancy this view of the pattern either at release, but I think that’s because there’s no back yoke so to me it’s odd/ unfinished. But with this gorgeous colour and the two tone effect, it works. Yeah, i didn’t understand the lack of back yoke either. That might have been my other issue with the design. That is super cute! I generally don’t care for color blocking either. I really like the subtle contrast you’ve done with this. It looks very cozy! The fit is spot-on too. Lovely. Interesting how you use the same jersey to make cuffs and bottom band… I thought we could only make them with matched ribbed jersey… Are they included in the pattern? Can you explain how you make them? See? All projects are interesting, even our everyday makes! The pattern includes pattern pieces and instructions for using self fabric to make the cuffs and bottom band. You can use ribbed knit, but it’s hard to get a good color match so most patterns assume you will be using self fabric. Love it and now I need more sweatshirt fleece. Win-win!! Splendid! I went and snagged the pattern for those leggings. Nice sweatshirt! Love it.